For the last three decades, Islamic Republic has organised Al-Quds rallies across the European cities on the last Sunday of Ramadan. In London, except on one occasion three years ago, the Al-Quds march has taken place completely unopposed. On that rare occasion three years ago, there were only seven of us then but we still managed to persuade a UK Left wing group not to join the rally. The whole purpose behind the carnival is nothing but propaganda for the Islamic Republic of Iran. By arranging this annual rally, the Islamic Republic wants to pretend to be a friend of the Palestinian people and attempt to recruit from those gullible individuals who would believe such Islamic Republic misinformation. The truth is of course very different. The clerical theocracy ruling Iran has brought nothing but misery, poverty, corruption, drug addiction, crisis and instability for the iranian people and it sure won't bring prosperity and happiness for the Palestinians or any other people. 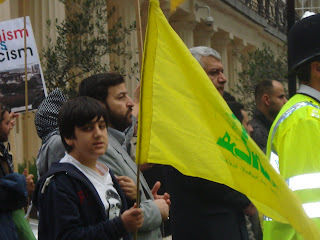 The Al-Quds rally in London this year was different for two reasons however. There were much fewer participants in the Islamic government sponsored march. In fact the marchers were more than two hours behind the schedule, desperately applying their rent a crowd expertise before they could begin their march. More significantly, the rally did not go unopposed today. Not only it did not go unopposed, but this time we were joined by other British groups and individuals who felt it was time to stand up to supporters of Islamic terrorism marching in the streets of London. Kudos to all the hard organising by Harry's Place in particular and the signatories to the Euston Manifesto, as well as Worker's Liberty and Class War who made it possible to finally show an opposition to the IRI lackeys in London. Today, thousands of people passing the Eros statue in Piccaddilly, realised that there are many who are prepared to stand up to the onslaught of Islamic fundamentalism in this country. Hopefully we can now build on this. non-Islamic Che and the infidel Fidel! if she walks in the streets of Tehran like that?? Probably not, I imagine she only watches the BBC. 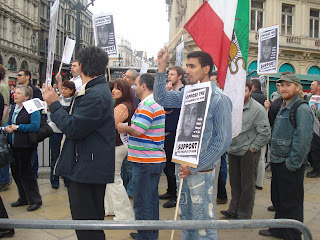 There were relatively few Iranians that took part in the march. The rest were mostly hired for the sake of free food handouts at the end. I am speechless... but thanks for that opposing gathering. good job! 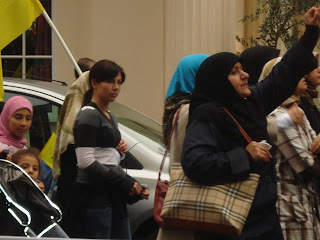 I am Glad that I went to this Anti Ghods day demonstrations and saw with my own eyes how the people of England (from all walks of life and political persuasions-from hard left to hard right) despised this Poor ugly creatures supporting the indefensible idea's and philosophies of the murdering Maid's army. This rag tag bunch of Idiots who were following a few turbaned paid mercenaries of Islamic Republic of Idiots (IRA) could not even feed themselves and their children for one day by working and earning a decent wage in this country. They are all scroungers from the Social Services and get their benefits and health care paid for from the taxes paid by the hard working classes in this country. They can STUFF their Sharia Law. It will never take hold in this country. Death to the Fascist Mullah's of Ghom who are supporting these poor ignorant people by sending them here and giving them free food and back handers in the mosques in order to bring them out and parade them for their own political games. NO ONE IN THIS COUNTRY BELIEVES THAT THE MULLAHS REALLY SUPPORT THE PALESTINIANS-EVEN THE PALESTINIANS HAVE SAID MANY TIMES THAT IT IS BECAUSE OF THESE IDIOT'S INTERFERENCE IN THEIR AFFAIRS THAT THEY LIVE IN SUCH MISERABLE CIRCUMSTANCES. Stop Interfering in other people's affairs-let them live in peace NOW. Good showing. Thanks for everything. The free world must stop this Islamic-Fascist circus of Al-Quds Day. And where were BBC Persian and VOA Persian? Why did they not cover the counter demo? Surely Iranians would be more interested in their compatriots standing up to Al-Ghods marchers in London than listening to Setareh Derakhshesh's reports on traffic in Krachi! The girl without the Islamic head cover in the photo... How ignorant she must be just like we were in Iran 28 years ago! Sad that we have not been able to tell them what happened to us. Thanks for helping out and showing your support - I was busy taking photos and generally being a bit too sleepy to network much, but it seemed like a lot of people weren't and we should have a pretty good network for future events. Although we were outnumbered on the day, Piccadilly Circus is London's busiest tube interchange - hopefully we got the message out to lots of passers'-by, as well as to the IHRC and their lackeys that we won't stay silent so long as they hold their Al Quds March. Iran has just named one day in its calendar as the Hezbollah Day! notice the berberi bag in the photo. its worth $500-$600. Such is the new acquired taste of the supporters of the mostaza'feen these days! I read a brief report on this in London based Kayhan. Was there a reporter from Kayhan? No one from Kayhan turned up, the reporter even got the day wrong, saying it was Friday! If you read Kayhan you must be Iranian and I assume you know what our so called reporters are like. They never come out to cover a report. They ask you to send pictures and the written report and still badly get it wrong. It was an excellent counter demo and it was good to meet up with fellow stop sharia activists. It wasn't only Kayhan who failed to show up. The press release about the counter demo was sent to all the UK media and across the world, but they are not interested in events that contradict their own agenda. Congratulations to Potkin and fellow organisers. We'll make it even bigger next year. I suspect Al Quds and its supporters will bottle it though and not organise a march next year.